Rebuilt Claughton No.6017 'Breadalbane' – but where? (Date 1st April 1933, photographer E.R. Morten).And what of the carriage just behind the front of the Claughton? Harry Jack sent in this second photo with the comment "After the ’mystery‘ Buxton shot — I just thought I’d be a bit playful. Amazing where LNWR locos got to!" Come on, somebody must recognise this unusual array of signals. Incidentally I have seen a photo of Breadabane as rebuilt but without smoke deflectors hauling a main line express, I think Euston - Liverpool. Hey, that’s not fair. We are LNWR people but this looks like some foreign railway, suggesting there was life outside Crewe. First thought - LBSC or SECR area, but don’t think Claughtons went that far south. Is it Newcastle or Gateshead ? Regarding Mystery Photo 17, the Claughton is arriving at Glasgow St Enoch. I would have replied before but have been unable to find my notes about the working. Harry Jack's photo is a clever deception intended to make everyone think it is a GSWR 4-4-0 arriving at the same place. In fact, it is a Caledonian 4-4-0 arriving at Amsterdam, or some similar station in Holland, in the early 1950s, and has been suitably doctored in the computer. The original was taken by Harry himself while travelling under orders from Her Majesty as LAC Jack, H. (RAF number still secret) from the UK via the Hook of Holland. Brilliant! Of course Ted is quite correct about the location: it’s the Glasgow & South Western Railway’s terminus in Glasgow - St Enoch. But what can I possibly say about his ingenious analysis of the second photo? I’m still laughing. This photo appears on p 33 of ‘Steam in Camera 1898-1959’ (Ian Allan 1972) - Photographs from the Ken Nunn Collection and is dated 1st August 1911. Manson G & SWR 18 class 4-4-0 No. 29 built at Kilmarnock in 1907. The text states that it is the 10.15 a.m. train from Carlisle. I've closely examined the doctored photo. Those coaches are clearly Belgian Railways squarewheelers as used on British Army specials between Ostend and Cologne, the tender is a W.D.austerity and only the loco has been changed, probably because in reality it was a Deutsches Reichbahn 2-10-0. Even James Bond would have smelt a rat. If I could convert a Kriegslok to a Manson 4-4-0, believe me, I would. I’m glad Robert Barlow mentioned the book of K.A.C.R. Nunn’s photographs (some beautiful pictures in there) which has a far better repro of the the St Enoch photo of G&SWR No 29. My (cropped) version was taken from Rixon Bucknall’s “Our Railway History” published in 1945, a perhaps forgotten book which must have had a tremendous influence on some of us spotters at the time, with its photos of clean and shiny pre-grouping engines, so different from the dingy dirt-encrusted locos of the war years and after. Interesting. Presumably the Claughton was working a St Pancrs-St Enoch express from Carlisle. Are the carriages of the main train Midland? My first reaction was very like Mike Williams’s, that the photograph was taken on the LBSC or SER: the signals have an southern look. So I wondered whether it might be Brighton, or even Clapham Junction, if the Claughtons ever took the Sunny South Special all the way south in LMS days. After all the LBSC took the train to and from Rugby in LNWR days. The first carriage behind the Claughton looks North Western to me, but the second seems to have one of those small steel lookouts provided by the LMS in the upper body sides only, so I reckon its an LMS-built vehicle. The suburban carriage on the track behind is not LNWR. Interesting point about through working onto the LBSC. Wish I had an answer! It certainly is Glasgow St. Enoch�. the distinctive style of the Engine Shed roof, in the background, is the key. However, the train in the picture seems unlikely to be a parcels and and also seems to be arriving in the afternoon, whereas the 11:15pm from Manchester might be expected to arrive in the early morning. It is a pity that four lines of text were expended on explaining that there was not enough space to give full details of Claughton workings to Glasgow but it at least seems possible that the train in the photo was the one mentioned, the 12:58pm from Carlisle arriving at St Enoch at 3:23pm. Both photographs are definitely St Enoch Station Glasgow. If you look closely at the second picture you will see that the semaphore arms have been 'cut off' by the photographer, and it is taken from the same location, if not a bit further forward (than the first picture). I would say that the second picture was taken in GSWR days, as the locomotive appears to be Manson no 29. The train is just about to use the cross-over into the platform where the photographer is standing, and which is also visible in the first picture. I'm certain that it's St Enoch station in Glasgow. As quite a few of your correspondents have already spotted, both photos were, indeed, taken at Glasgow St. Enoch and the train hauled by the Claughton is signalled into Platform No.4. The photographer was standing near the end of Platform No.6 in both cases. This platform was extended to the location seen in the photo when the station was enlarged and an additional six platforms (Nos. 7-12) added in 1901. The Claughton photo clearly shows part of the old G.& S.W. St. Enoch engine shed behind the signal box and the main signal gantry. 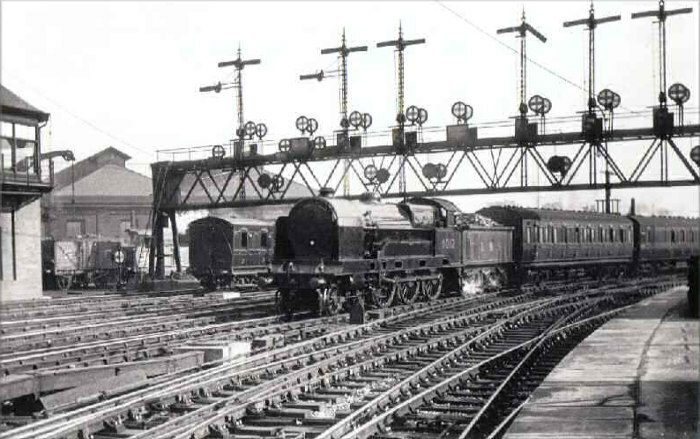 This was located in the triangle of lines bounded by Clyde Junction (which both trains have just passed over), Saltmarket Junction and St. Enoch Station Junction. The shed (closed in 1935) had long lost its former importance when the Claughton photo was taken as the G.& S.W. had built a new one in 1896 at Corkerhill on the Paisley Canal line, together with a 'model village' for shed staff. The G.& S.W. signals and the signal box itself were replaced by a new power box and colour light signalling by the L.M.S. in 1934(?). Glasgow St. Enoch closed on 27 June 1966, with the L.M.S. signalling still in use, and remaining services were transferred to Glasgow Central.